This post covers what happened in Decred in the month of January. 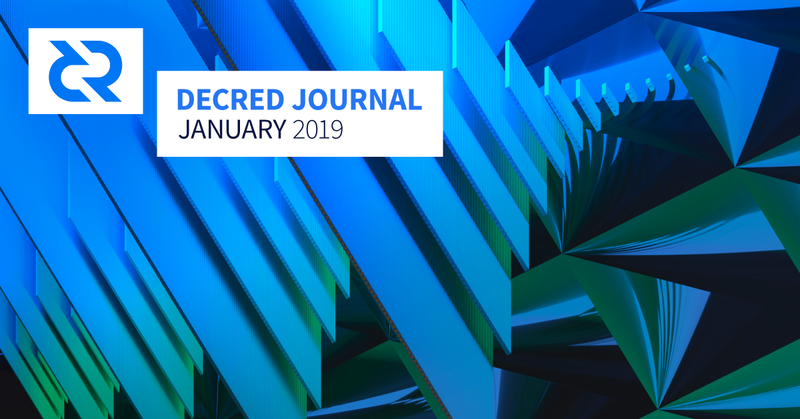 It is the 10th issue of the Decred Journal and you can find the original post on GitHub. Past issues are available via this GitHub link. The dcrandroid mobile wallet that uses Decred’s peer to peer SPV mode was released (v1.0) and is available in the Google Play Store. The community consultation process to define Decred’s foundational messaging was concluded, the tagline selected as part of this messaging is: “Decred: Secure. Adaptable. Self-Funding.” Outreach efforts have shifted to planning the year’s activity, with pre-proposals on events and marketing spending being shared in chat and on reddit. Discussion started how to further improve stake difficulty algorithm by removing oscillations — this could make ticket price even more smooth. Since release candidate 2, final version added sync progress display, no wifi alert, new splash screen and minor bug fixes — full changelog here. Congrats dcrandroid team! decred.org: Huge effort to migrate the site to Hugo was completed by @peter_zen. Hugo is a static site generator written in Go that makes updating site content much easier. Several site speed optimizations were enabled. voting.decred.org dashboard is being updated in preparation for the upcoming consensus vote — congrats @jholdstock with diving into Go! Dev activity stats for January: 242 active PRs, 243 master commits, 60K added and 47K deleted lines spread across 8 repositories. Contributions came from 2–8 developers per repository. In January the Treasury received 16,776 DCR and spent 9,991 DCR. Using January’s daily average DCR/USD rate of $17.1, this is $286K received and $170K spent. As these payments were for work completed in December, it is also informative to consider them in the context of the December average daily rate of $17.5 — in which case the USD received/spent figures are $294K/$175K. Contractors are now getting paid on ~15th of each month for the prior month’s work. The delay between invoicing and getting paid was cut in half from ~30th day. Work is ongoing to further decrease this delay. “RFP: Decred Decentralized Exchange Infrastructure” proposal was submitted by @jy-p. It outlines motivation and high level design of the DEX first described in June 2018 post. The project is estimated to complete in less than 6 months with a budget between USD 100,000 and USD 1,000,000. Voting will happen in 2 phases: the first proposal will determine if stakeholders want to pursue this, if the first proposal is approved then proposals will be invited from interested teams and the second phase will be to select one of these. This process is known as request for proposal. @Dustorf is preparing proposals to improve transparency and increase stakeholder’s control of the allocation of funds for the marketing activities. Events spending pre-proposal was published for feedback on Reddit after first iteration in chat. Marketing budget pre-proposal also started in chat and landed on Reddit after a first round of feedback. Hashrate: January’s hashrate opened at ~187 Ph/s and closed ~225 Ph/s, bottoming at 144 Ph/s and peaking at 312 Ph/s throughout the month. As of Feb 8, pool hashrate distribution: Poolin 29%, F2pool 26%, BTC.com 19%, UUPool 8%, Luxor 4%, CoinMine 1% and others are 13% per dcrstats.com. Pool distribution numbers are approximate and cannot be accurately determined. Staking: 30-day average ticket price was 109.4 DCR (+6.4) on Feb 4 per dcrstats.com. The price varied between 101.5–111.6 DCR. Locked amount was 4.20–4.38 million DCR, which corresponded to 46.3–47.5% of the available supply. Obelisk batches 2–5 are shipping, Gen 2 firmware update contains new features and bug fixes. Class action filed over Obelisk’s sale of SC1 and DCR1. Our best selling product on the website has undoubtedly been the famed Decred Jacket! It’s been an honour to serve the Decred community for so long and help market a project I truly believe in. Marketing team is planning to approach reporters publishing inaccuracies about Decred. As a test case for that workflow one horrible article was scrutinized by the community and Ditto collected the feedback for that and future cases. Ditto has systems to catch every piece of media written about Decred. As they get to know the community better, it will be possible to address inaccuracies in real time. Another issue discussed was integrating Ditto’s corrections workflow with voluntary submissions from the community. Tagline for Decred was extensively discussed in #marketing and on Reddit. Final version of messaging settled it on “Decred: Secure. Adaptable. Self-Funding.” which gathered most support. As time goes this will be revised to adapt to the ever changing space. Worked with the community to source commentary on 51% attacks for future use with reporters when another attack inevitably happens — the goal being to get Decred’s message in front of journalists even when it doesn’t have any hard news to share. Secured media coverage: feature article in Forbes (report), video interview with Joshua for Bitsonline, commentary by @richardred on the delay in Ethereum’s hard fork in Breaker Mag and Crypto Briefing. Drafted an announcement of the bug bounty program and placed it in Hacker Noon — thereby reaching a much broader pool of developers, compared to Decred’s own channels. The community welcomes and encourages questions, even if the person asking fears that their questions are “stupid.” We’ve observed a spirit of collaboration and willingness to help that we haven’t seen in other communities. It’s refreshing! The North American Bitcoin Conference in Miami, USA. Attendance was surprisingly low: 6K people were expected but only 1.8K were claimed after the event. @jy-p’s presentation Applications of Blockchain Time-Stamping was well done and well attended given the overall numbers. 3 members went through media training and found it useful, 7 more are scheduled. Store of value, “Secure. Adaptable. Self-Funding.”, and the accompanying messaging was found to be a very effective way of talking about Decred. It was found to be most clear and impactful. Full report with links to photos and videos here. Campus Party in Sao Paulo, Brazil on Feb 12–17. Jalisco Talent Land in Guadalajara, Mexico on Apr 22–26. Contact @elian if you’re interested in helping/attending. Portuguese podcasts started by @michae2xl, available on Soundcloud, Spotify, Apple Podcasts and Google Podcasts — search for “Decred Brasil”. Decred page on Wikipedia was deleted. On Jan 8 a user removed a bunch of “bad sources” and on Jan 10 vandalized the page by removing a large and important part of content. Just 4 hours later another user nominated Decred page for deletion — the 3rd attempt to take it down. For background, the author of 2nd nomination for deletion had interesting views on notability and was banned as a sockpuppet. On Jan 11 content removal was reverted and its author was banned as sockpuppet, but next day the removal was applied again by another user without much commentary. After the slicing the page became very small and all reviewers voted to delete it due to lack of reputable sources. All suggested recent articles in major crypto media were deemed not good enough references. On Jan 18 the page was deleted and removed from List of cryptocurrencies that was left with more notable coins. Details and links to discussions are captured in this issue. Experienced Wikipedia editors are welcome to help. Decred Journal — December 2018 in Chinese by @guang, in Polish by @kozel, in Portuguese by @maiconjunge, in Russian by @DZ and in Spanish by @elian. Wow. Thank you all for spreading Decred Journal around the world! All translations are listed here. decred-issues grew to 105 issues as of Feb 9. Check it out, perhaps you’ll find something interesting to do! Criticism from Bitcoin maximalists triggered a discussion on how Decred looks in context of securities laws. One vector critics use is that Decred’s premine and airdrop was not fair and “hand selected”. This is a misrepresentation of the (huge) manual effort to filter out airdrop cheaters, per this discussion that also has many useful links describing Decred’s launch. One interesting insight shared is that ~300K (35%) airdropped coins never moved. Another related chat was about Twitter attacks claiming how Decred’s initial distribution was not transparent or fair, while avoiding inconvenient facts about Bitcoin’s early mining and Satoshi’s million BTC. Finally, a history lesson explained early days of staking and made a point that original devs had no unilateral control of consensus rules from day 1. In January DCR was trading between USD 15.5–19.5 / BTC 0.00435–0.00487. The average daily rate was $17.1. Ethereum’s developers decided (tentatively) on Jan 4 to go ahead with a change of mining algorithm from Ethash to ProgPoW. This move is intended to stop ASICs from mining Ethereum. The Block outlined concerns like reduced attack cost after the switch, weaker incentives of GPU miners, questionable benefit of transfer of power from Bitmain and Innosilicon to AMD and Nvidia, and a possible chain split. They concluded that the debate around the algorithm switch will be a good test for Ethereum’s governance process. Ethereum developers also delayed the Constantinople hard fork on Jan 15 after a security vulnerability which would have enabled a “reentrancy attack” was detected. Fundamentals of Proof of Work article by David Vorick makes the case for exclusive hardware cryptocurrencies and contrasts them with shared hardware cryptocurrencies that suffer from multiple issues, especially those pursuing ASIC resistance. One of the issues with non specialized hardware is that the hardware’s value is not closely related to the asset (because it can mine many other chains). Another issue is hashrate marketplaces, they allow hardware owners to get more profit by not caring about which coin they mine, even if the hashrate is rented to attackers. Decred benefits from specialized hardware and is by far the dominant coin for its algorithm (Blake256r14). Although this hardware cannot be considered “exclusive” to Decred, in addition to current hashrate dominance for its algorithm Decred has the PoS factor which is capable of denying rewards to misbehaving miners. Updated version of the “forkonomy” research by Wassim Alsindi (@parallelind) was published along with an up-to-date follow-up. Medium censored an article “How to use Bitcoin anonymously” which spurred discussion and an issue about migrating away from it, or at least treating it as one of multiple content mirrors. Backup your Medium posts, just in case. Cryptopia was hacked with loss estimates varying between $3–16 million. Binance froze some funds coming from the hack. Resource exhaustion vulnerability known as Fake Stake attack was discovered in 26+ blockchains based on PoSv3, the majority of them deployed mitigations. Part of the root cause is that in many such systems the Proof of Stake layer was “grafted in” to the Bitcoin Core codebase insecurely. One of report’s authors tweeted that Decred is not affected.